"This is the 12th location we've hired UpdatesCentral for and they did not disappoint. 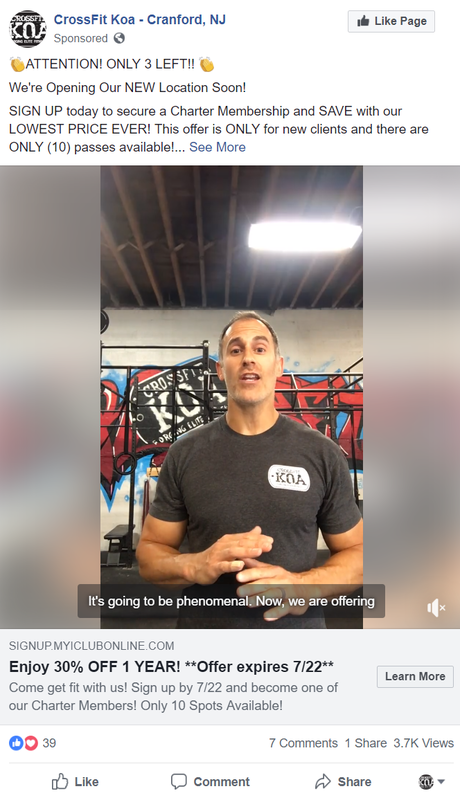 We added 20+ paid-in-full memberships within the first 30 days"
CrossFit KOA is expanding and relocating and needs to accelerate growth to meet their expansion goals. Frank Bastone, a long-time UpdatesCentral customer hired UpdatesCentral to support marketing and lead generation. UpdatesCentral tested a series of campaigns to find a top performer. Using Facebook Lead Ads with various creative formats, a top performer was identified and scaled within the first two weeks of service. Unlimited daily updates on Instagram, Facebook, and Google help free-up the owners time to handle leads and work with members. UpdatesCentral generated 50+ high quality leads on time and under budget, with more than 20 leads converting into paid-in-full annual signups valued at ~$1300 each. CrossFit KOA retained more than $26,000 in revenue to help finance their expansion and establish their new location.